This antibody does not cross-react with murine CXCL9 and CXCL11. 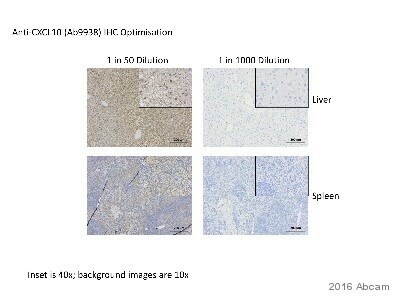 Recombinant mouse IP10 protein (ab9944) can be used as a positive control in WB. Our Abpromise guarantee covers the use of ab9938 in the following tested applications. WB Use at an assay dependent concentration. To detect mIP-10 by Western Blot analysis this antibody can be used at a concentration of 0.1 - 0.2 µg/ml. Used in conjunction with compatible secondary reagents the detection limit for recombinant mIP-10 is 1.5 - 3.0 ng/lane, under either reducing or non-reducing conditions. Neutralising Use at an assay dependent concentration. To yield one-half maximal inhibition [ND50] of the biological activity of mIP-10 (15.00 ng/ml), a concentration of 0.5-0.9 µg/ml of this antibody is required. Staining of colchicine injected mouse brain (including the hippocampus region) tissue. The primary antibody was incubated at 1.0 ug/ml overnight at 4°C. This was followed by a peroxidase conjugated secondary antibody and then a fluorescein reagent. Optimal concentrations and conditions may vary. Staining in colchicine injected mouse brain (including the hippocampus region) tissue. The primary antibody was incubated at 1.0 ug/ml overnight at 4°C. This was followed by a peroxidase conjugated secondary antibody and then a fluorescein reagent. Optimal concentrations and conditions may vary. Publishing research using ab9938? Please let us know so that we can cite the reference in this datasheet. Band at 20 kDa instead of 10 kDa with mouse ovarian cancer cell line. What molecular weights are the ladder bands in the WB image? The molecular weight for this protein is 8.7kDa on a western blot. I hope this is helpful. Please let me know if you have any additional questions. Thanks for running the experiment again with the diluted primary and secondary antibodies. A few points: 1. A couple other western blots of IP10 I have seen show detection of a band around 14kDa. I don't know what the molecular weight markers on your blot correspond to but the band just above the 10kDa marker you have labeled could be IP10. This band is much more intense than in the first blot. 2. There does still appear to be higher molecular weight bands that ab9938 is detecting in the small slice of the gel you provided from your second experiment. However, there are substantial decrease in other bands, for example in the doublet which migrates with the 3rd marker band from the bottom. 3. If you do have access to a variety of mouse tissue, IP10 is known to be highly expressed in tonsil, spleen and thymus, for example. It might be useful to use one or more of these tissues as a positive control. 4. I think you can even dilute the antibodies further, which would further reduce background bands. For example you might try using the secondary at 1:20,000 and the primary at 1:5000. Also, reducing the amount of protein loaded on the gel may also help reduce background bands. I look forward to hearing if these ideas prove useful. Thank you for your suggestions. I haven’t tried any other antibodies yet but it has been reported that IP-10 is present in pancreas by numerous literatures. I could try the dilutions as you suggested, but my concern is that I didn’t even see the target bands in higher dilutions. If I reduce the antibody, I could reduce the backgrounds bands but may not be able to see target bands as well. Your concerns are certainly valid ones and repeating the experiment with increased dilutions of the primary and secondary may just decrease all the bands equally. However, diluting the antibodies may instead serve to reduce the background and simultaneously promote specificity of the antibody to its target. Since the increase in dilution factor I'm suggesting is so large for both antibodies, I think there is a good chance the data could be improved here. I wonder that can we recommend ab9938 for migration assay for our user? This antibody has been tested on a neutralisation assay (also known as a migration assay), so is suitable for the user.